The creative craftsmen of your smile. The quality of dental prostheses is an essential part of successful treatment. The choice of the laboratory producing them is therefore a major factor. In order to guarantee continual cutting-edge quality, Adent has set up its own internal Adent 3D laboratories | Dental Design Department.. Located within the Yverdon, Ecublens and Charmilles-C1 clinics, the laboratories provide direct proximity to dental technicians. This special relationship between patient, dentist and technician makes possible the creation of fixed or removable reconstructions, combining aesthetics with Swiss excellence. Using expertise combined with new technology, all prostheses are made to order by craftsmen, and offer a broad range of solutions and treatments for everyone: Silensor anti-snoring splints, whitening splints, complete reconstruction by means of dental implants, dental crowns, sports mouth guards, partial and complete prostheses. In some cases, using innovative materials makes it possible to phase out the use of metal in favour of biocompatibility. Adent 3D laboratories also work in partnership with dentists in the private sector who are seeking excellence. Adent 3D is thus in continual development. To guarantee this same quality in clinics where Adent 3D is not yet working, long-term partnership contracts have been concluded with local Swiss laboratories whose quality has been validated by our practitioners and technicians. This close collaboration ensures a very high « Swiss made » quality and also shortens the production time of the various prosthetic components. 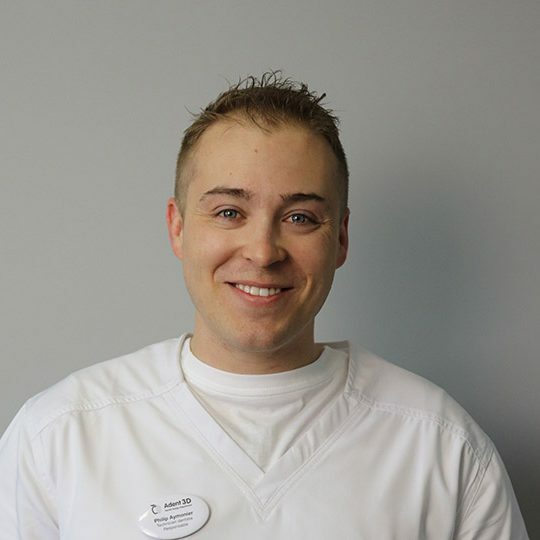 Four years ago, when I became the head of the Adent 3D Dental Lab, I only worked with two clinics. No other clinic had been obliged to work with the internal laboratory. Therefore, in order to convince them, I refused to play the “low cost” card and I established a high-end quality criteria, superior service and availability, and introduced simple production and communication protocols. We make the dentists want to collaborate voluntarily with the internal laboratories and consequently with the quality that we provide, we can keep them in the long term. In terms of numbers, the progress of Adent 3D laboratory is clear: We had a 30% growth of prosthetic work done during the year 2017. It is in this sense that we are continuing to evolve. It is very important for us to know how to observe the protocols relating to Adent Group practitioners: quality marks, timeliness, accuracy, etc. and to accompany such with our expertise and our knowledge of dental technician. From a technology point of view, the subjects addressed in the year 2017 and on which we will continue to progress with. They are digitization, processing and 3D printing. We have been enriched by the experience of the major European dental laboratories, and we are constantly following the evolution of devices and other intraoral scanners. We are attuned to any developments which bring quality and precision to prosthetic works and which could, perhaps one day, provide all the Adent Group’s clinics with “Swiss made” label. The profession of a dental technician is constantly evolving and we must evolve and grow with it.